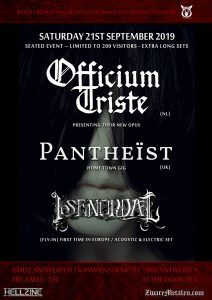 We are excited to announce that Pantheist will be sharing the stage again with Officium Triste, in Antwerp on 21st September 2019. This will be a very special, seated event with extra-long sets, and it will be held at AMUZ – the former church of St Augustine, which is now an international music centre. Capacity is limited to 200, so get your tickets now before it sells out! For more information, go to the gigs page.